Play, love, and learn with our dolphins. Snorkel over a gorgeous reef. Indulge in a buffet lunch. Non-swimmers and children can enjoy this excursion, which is great for the whole family. Experience all the hidden treasures of Cozumel. The dolphins, the reef, and the island, are full of surprises. You've probably watched them at the beach as they play and hunt. Dolphins are beloved mammals who thrill ocean visitors with their playful antics. Now you have the opportunity to see these human-friendly creatures up close, even if you can't swim. 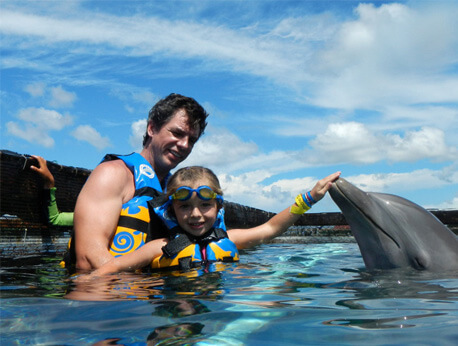 Our Dolphin Encounter Program in Cozumel allows visitors to see dolphins in their natural habitat, the Caribbean Sea. Thanks to a raised platform that is under the water, family members who can't swim will still be able to enjoy the dolphins. Imagine, standing in the ocean, safe and secure, while playing with these marine mammals. This is a dream for swimmers and non-swimmers alike! You will not just see the dolphins. You will get the opportunity to interact with them. You can start out by meeting our dolphin friends with a formal handshake. Then, you’ll receive an amazing photo opportunity if you dare to kiss one of them! These dolphins have all gotten their start in life with the help of highly-trained staff in our dolphinarium. Our program, 'Miracle', is such a success that international organizations have taken notice. These graceful, friendly creatures can change a person's perspective on oceanic mammals just by interacting with them for a few minutes. When you see how they behave and how interact with humans, you will never view them the same way again. After the program, you and your family will have the chance to snorkel in crystal clear, warm waters at the Chankanaab National Reef Park. Here, the view is amazing. The fish and sea creatures living in and around the reef are spectacular. See vivid blues and yellows, spines and odd shapes— everything hiding in plain view underneath the ocean's surface. Your package will include all entrance fees, lunch, and two drinks (non-alcoholic). The program also gives guests a 15-minute explanation of what can be expected followed by 30 minutes of play time. Then, go enjoy some fantastic snorkeling. This is something your family will remember forever.